I am so excited to show this craft because it is so easy to make, and sooo cute! This is actually a class kit Basic Grey had designed and I loved it so much I HAD to make myself one! You can get the kit on our website for just $19.99, their retail value as a kit (with colored instructions) is $25.99! But, I have a secret for you :) If you text UTAH to 32323, that will send you a link to The Utah Discount Card App. I have a promo code for all Utah Discount Card holders that is a 20% discount on ALL orders! Get the app to get your promo code (and tell your friends about it!) . Meanwhile, here are some instructions if you happen to have the supplies to make this at home! Trim (4) 1.5x6.5 inch strips of Cleopatra. Lay them out to make a square to cover the frame. Take 2 of the 1.5x6.5 and make an “L” shape. Overlap at the corner. Adhere them lightly with removable adhesive. Cut at an angle from the outside corner to the inside corner where the pieces meet. Discard the trimmed pieces. Work your way around the other 3 corners with the remaining 1.5x6.5 pieces, repeating the step above. Ink edges and adhere pieces centered around the frame. Add the faux stitch marks with a brown pen to mitered edges of the corners as shown. Punch 12 2-inch scalloped or regular circles from Wild Grape Bistro paper. Make a stack of six circles and place a brad in the center for a secure hold. Scrunch up the first circle tight folding to the center and continue with the rest of the layers. Start unfolding the layers beginning with the bottom layer. Unfold each layer a little less than the last and form the flower. Repeat steps 7-9 to make second flower. 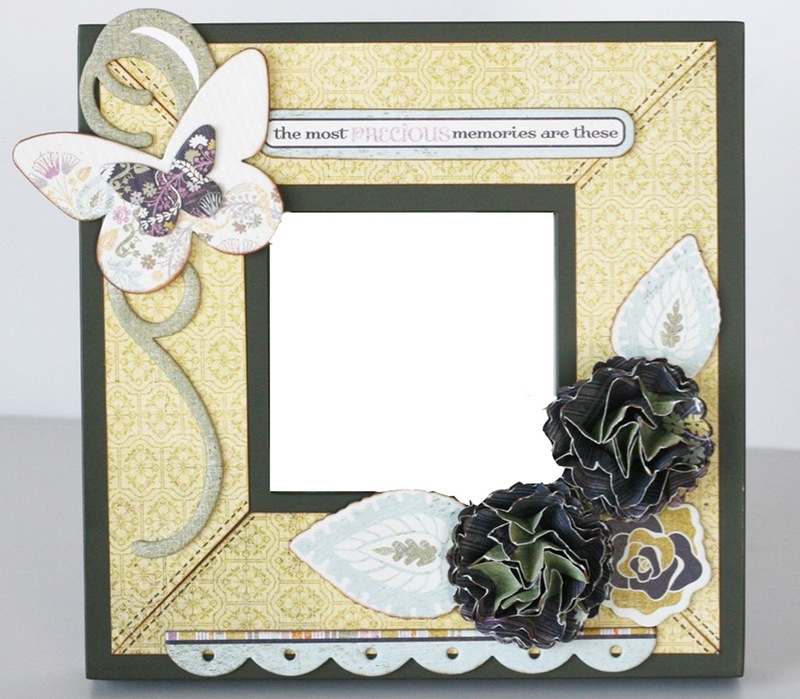 Arrange paper flowers, Chipboard Shape leaves, scalloped border and flower in lower right corner of frame, chalk edges and adhere. Chalk edges and add Chipboard Shape butterflies, sentiment and flourish to upper left corner.